Sail away in the lap of luxury. Only on the Seabourn Sojourn. 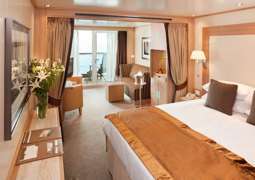 Enjoy a relaxing, luxury cruise vacation with the Seabourn Sojourn. An Odyssey class ship, the Sojourn provides an intimate, small-ship cruise experience with a notoriously high quality of service. Sophisticated travelers who want to explore exotic destinations around the world in a high-class atmosphere would do well to choose the Seabourn Sojourn. Sailing to unique ports worldwide, and with a service staff so proactive it feels like they can read your mind, the Sojourn offers a one-of-a-kind laid back, luxury cruise experience. Built in 2010, the Sojourn is outfitted with modern amenities and a welcoming, contemporary interior design. A color scheme of whites, pale beiges, natural dark wood tones, and accents in lilac make for a relaxing environment. The public spaces are spacious and elegant, with plenty of places to lounge in the sun, curl up with a cup of coffee or sit and enjoy a cocktail. 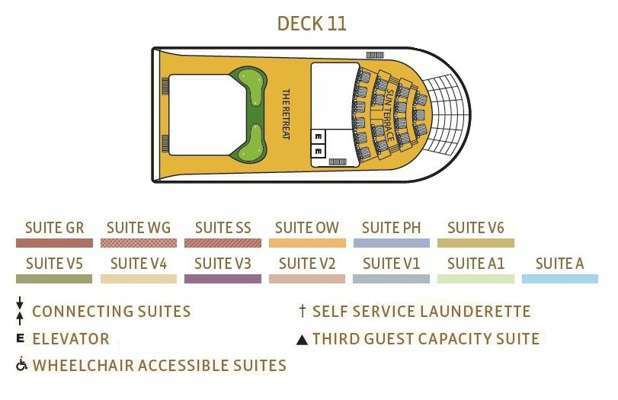 Instead of an imposing lobby, the Sojourn has Seabourn Square, the ship's inofficial "living room" where guests can socialize, lounge, and utilize the concierge services. 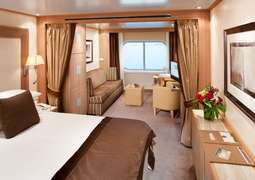 The luxurious, all-suite accommodations on the Seabourn Sojourn all have an ocean view, and 90% have private verandas. Oceanview suites start at a spacious 295 square feet and come with luxurious Egyptian cotton bedding, 24-hour complimentary room service, an in-suite bar stocked with your choice of beverages, a flatscreen TV, and high-end bath products. Upgrade to a Veranda Suite for a roomy 300-square-foot suite with a balcony providing an additional 65 square feet of space. Experience all-inclusive gourmet dining on the Seabourn Sojourn. You'll feel spoiled for choice at the ship's many dining venues. At the main dining room, The Restaurant, experience a gourmet take on your favorite comfort foods from. The Grill by Thomas Keller is an all-American steakhouse specializing in meaty mains and sumptuous sides. More casual, bistro-style fare is available during breakfast and lunch at The Patio by the pool or The Colonnade on Deck 8, though The Colonnade turns into a sit-down, reservations-only restaurant at night. Activities on the Seabourn Sojourn include cooking demonstrations, educational lectures, and wine tastings. Solo musicians and dance ensembles liven up the evenings, as do the occasional deck party and cultural show. If you sign up for Shopping with the Chef, you can accompany a master chef as they browse local markets at different ports of call – and often taste the fruits of their labors in The Colonnade at dinner that night. A well-equipped salon and spa offers holistic health workshops and professional beauty treatments, and water lovers can soak in one of the many pools and hot tubs onboard. Daytime dress code is officially casual, but many passengers opt for more of a country club look than resort casual. Regular evenings call for elegant casual dress in all indoor spaces, and the once-weekly Formal Nights call for suits or tuxedos for men, dresses or pantsuits for women.